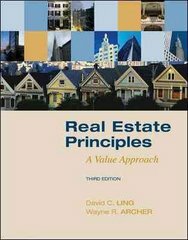 Real Estate Principles: A Value Approach 3 Edition Real Estate Principles: A Value Approach demonstrates how value is central to virtually all real estate decision-making. Students using Ling and Archer should finish the course with a value-oriented framework, and a set of valuation and decision making tools that can be applied in a variety of real-world situations. The key to making sound investment decision is to understand how property values are created, maintained, increased or destroyed.Since the launch of Real Estate Principals: A Value Approach, 2e significant and lasting changes have come upon the world of real estate. This is very true in real estate finance and capital sources where most of the traditional lenders have been transformed or displace, giving way to a radically different set of player in mortgage finance. There has been change as well with profound and far-reaching implications in a world where it is understandable that property values can go down as well as up. This realization will color every aspect of real estate investment, finance and transactions for the foreseeable future.